Is your bathroom looking outdated and in need of some renovations? Well, our expert New Orleans bathroom remodeling contractors can help with all your bathroom remodeling needs. There are many ways you change and update the look of your bathroom. Some updates could include: changing the bathroom fixtures, installing a new bathroom sink and vanity, new flooring and more. Our bathroom remodeling team can take your ideas and turn them into a beautiful design. 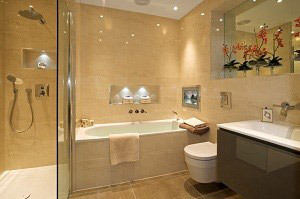 Then from there our remodeling contractors can take the design and turn your newly remodeled bathroom into a reality. Our design team and remodelers will give you a bathroom that looks great, with improved functionality and with a price tag that fits within your budget. Our bathroom remodeling team can install or replace any bathtub, shower, glass sliding door, flooring, fixtures, faucets, sinks, cabinets, toilets, etc. If it can go in a bathroom, we can install it.